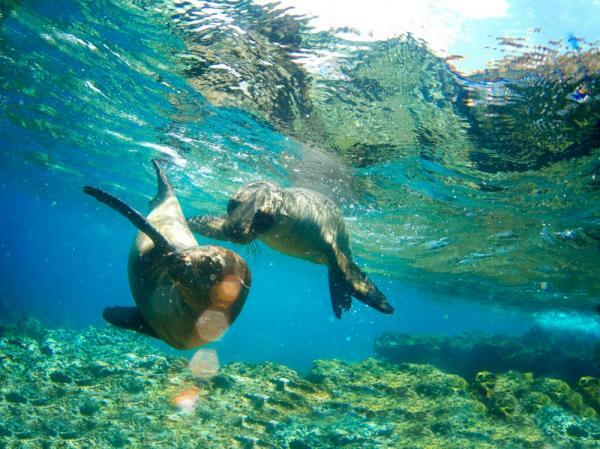 Embark on an 8-day cruise aboard the M/T Camila around the stunning Galapagos Islands. Each island boasts new and exciting wildlife and landscapes carved from volcanic activity. Your journey includes snorkeling alongside sea turtles, viewing large colonies of sea lions and nesting shorebirds, and short hikes to panoramic views. Visiting Baltra, Isabela, Santa Cruz, Santa Fe, South Plaza, Floreana and more! Keep an eye out for the magnificent mola-mola sunfish! 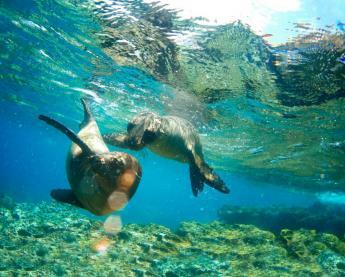 Welcome to the Galapagos Islands aboard the M/T Camila. The guide and crew greet you and show you to your accommodations upon your arrival. Afterwards, the guide and cruise manager hold a short briefing on all safety and emergency protocols, different areas of the vessel and the normal routine of the itinerary. 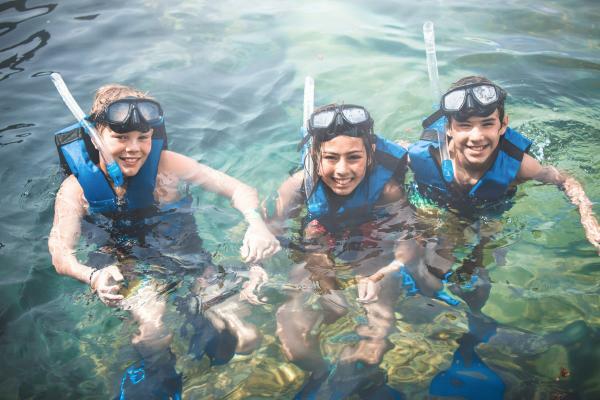 Activities: Hiking, swimming, and snorkeling. Possible Wildlife: Sea lions, various shorebirds, sally lightfoot crabs. What to Bring: Sturdy hiking shoes and walking sticks to aid on the uneven terrain. 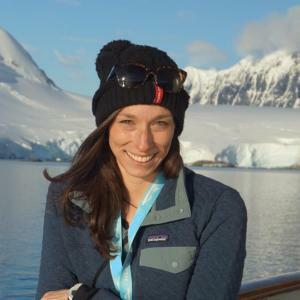 Possible Wildlife: Sea lions, blue-footed boobies, various shorebirds, mola-mola sunfish, sea turtles, Galapagos penguins, Nazca boobies, sally lightfoot crabs. What to Bring: Dry bag for a camera or any electronics brought onto the panga. If you like historic remnants, then you can enjoy finding what was left behind by pirates and sailors in the 1800s. This site was one of their preferred pit stops while traveling the seas. The hike here will provide incredible views of the cove and on the other side the mangrove forest where the last 35 pairs of Mangrove finches thrive. What to Bring: Walking sticks and sturdy footwear for the hike, a camera is a must! On the eastern coast of Isabela Island is Elizabeth Bay with many islets. 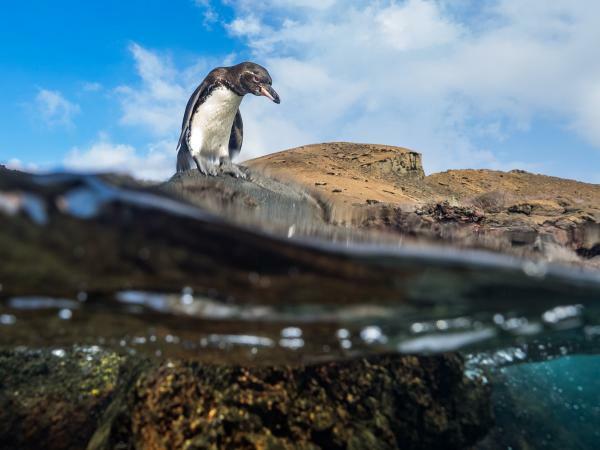 These parts are visited by panga and on the rocky shores, Galapagos penguins can be seen. There is a large abundance of marine life that can be seen in the clear waters. It is great for snorkeling. The beautiful rocky shores of Moreno Point offers a plethora of birds to be seen. 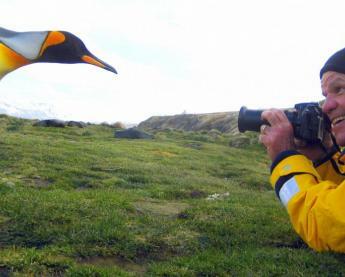 It is truly a birders delight. The main attraction is the coast lagoons where white tipped sharks can be seen and the panoramic views of Sierra Negra and Cerro Azul volcanoes cannot be missed. Possible Wildlife: Sea lions, great blue herons, various shorebirds, flightless cormorant, marine iguanas, sally lightfoot crabs, sea turtles, land iguanas, Galapagos Hawk, Galapagos tortoise. Possible Wildlife: Galapagos tortoises in captivation and various stages of tortoises. The highlands are located in the northern part of Santa Cruz and can reach elevations up to 1500 meters. This area is rich with hills, ferns, volcanoes and, wildlife. A great contrast to the molten lava harden beaches and rocky areas of other islands already seen. It is home to giant tortoises, mockingbirds, finches and many other species. Possible Wildlife: Galapagos tortoises, finches, mockingbirds, lava lizards, pintail ducks, other shorebirds. Possible Wildlife: Santa Fe land iguanas, frigatebirds, sally lightfoot crabs, sea lions, finches, various shorebirds. What to Bring: Sturdy footwear for hiking and walking sticks. Possible Wildlife: frigatebirds, sally lightfoot crabs, sea lions, land iguanas, swallow-tailed gulls, various shorebirds, and seabirds. 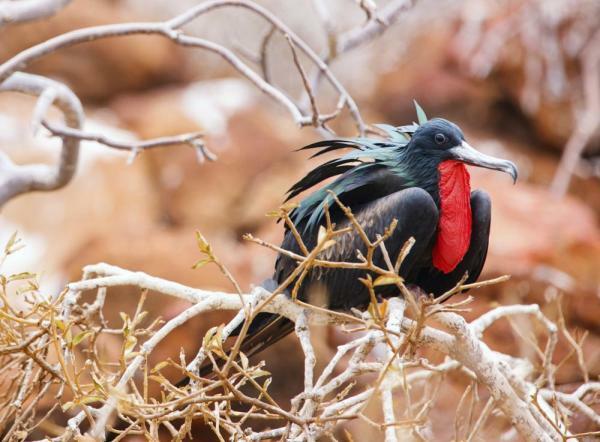 Possible Wildlife: frigatebirds, sea lions, sea turtles, various shorebirds and seabirds, marine life. What to Bring: Bring your swimsuit and don’t forget your postcards. Just off of Floreana Island is a fantastic snorkeling site known as Devil’s Crown. Various tropical fish species can be seen, even Galapagos sharks or white-tipped sharks. Sea lions can be seen hunting for fish or playing through schools of hundreds of fish in circles, it is really quite the site to see. Cormorant Point on Floreana Island is a great place to see one of the places where flamingos live in saltwater lagoons. Walking along the trail after the lagoon leads to a hidden beach great for walking in the soft sand. Watch your feet if walking in the water, stingrays love to hang out here as well. Possible Wildlife: frigatebirds, sea lions, sea turtles, Galapagos sharks, white-tipped sharks, tropical fish, various shorebirds and seabirds, marine life. What to Bring: If you have an underwater camera, this is definitely one of the best places to bring it while snorkeling. 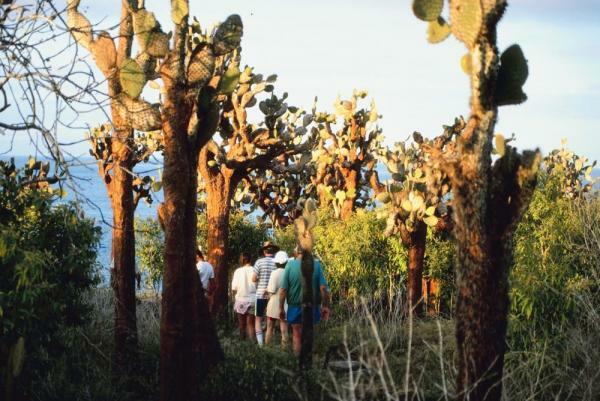 At the interpretation center, find many different exhibits on information about the natural and geological history of the Galapagos Islands. 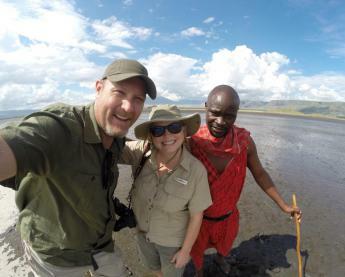 It first opened in 1998 to help enforce the efforts of wildlife protection and the natural environment through means of population and tourist control. 215ft./269ft. Located on the main and upper decks, all cabins feature luxurious amenities, private bath facilities, and private balconies. - Please provide your wetsuit size in advance prior to the trip. - All prices are per person, based on a double occupancy. Final payment is due 70 days prior to departure by check, money order, or bank transfer.